White short-sleeved shirt with non-contrasting pin stripes and a v-neck collar overlapping from left to right. Silver satin strips along each shoulder. Embroidered emblem on left breast, with white border and a silver star above the emblem. Lower-case 'v' in blue below the emblem. The opponent's name in capitalised blue lettering below the 'v', flanked on each side by a sword pointing outwards, outlined in blue in the top half on the left and in the bottom half on the right, and in solid blue in the bottom half on the left and in the top half on the right. The date in blue, in numeric form (e.g. 03�09�14 against Norway) was below the opponent's name. Blue Swoosh on right breast, blue number in centre of chest, in a new font, and on reverse with a v-shaped mesh, with surname in capitalised blue lettering above number on reverse in same font, and blue emblem at base of each number on reverse. Fifteen sets of rounded white v-shaped plastic strips running alongside each side seam on the inside of the front of the shirt, with nine ventilation holes on each, getting progressively smaller from the middle outwards, and with gaps between sets of five upper strips, and four, three, two and one below them. Rectangular black label on left hip with AUTHENTIC in large silver capitalised letters, with two silver lines underneath, followed by a nine-digit serial number in silver below, all within a silver border occupying two-thirds of the left-hand side of the label. Remaining third comprises a black Swoosh, with a black line underneath, followed by 2014 in black below, all on a silver background of interlocking diamond shapes. DRI-FIT in capitalised grey lettering embroidered onto right hip. White shorts, with white drawstring and a silver satin strip down each seam. DRI-FIT in capitalised grey lettering embroidered onto right hip. Blue number on left thigh, in same font as on shirt, with blue Swoosh underneath. Embroidered emblem on right thigh, with white border. White socks with a blue Swoosh on shin. Pattern of four grey blocks on back of calf. Patterned grey footings, with black borders. DRI-FIT in capitalised black lettering in a grey panel, with a black border, on each heel. Against Peru, England's captain, Steven Gerrard, wore a plain red armband. The armbands worn in the World Cup final tournament were blue and featured the MY GAME IS FAIR PLAY FIFA logo. In the other six friendly fixtures, England's captain wore a red emblem with the opponent's name in capitalised blue lettering below the 'v', flanked on each side by a sword pointing outwards, outlined in blue in the top half on the left and in the bottom half on the right, and in solid blue in the bottom half on the left and in the top half on the right. The date in blue, in numeric form, was below the opponent's name. In the seven European Championship qualification fixtures, England's captain wore a blue armband featuring the UEFA NO TO RACISM logo. 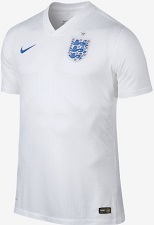 For the first game in which this shirt was worn, against Peru, England did not wear any match details on the shirt. The names of England's opponents, as they appeared beneath the emblem, were COSTA RICA, ESTONIA, FRANCE, ITALY, LITHUANIA, NORWAY, REPUBLIC OF IRELAND, SAN MARINO, SCOTLAND, SLOVENIA, SPAIN, SWITZERLAND and URUGUAY. 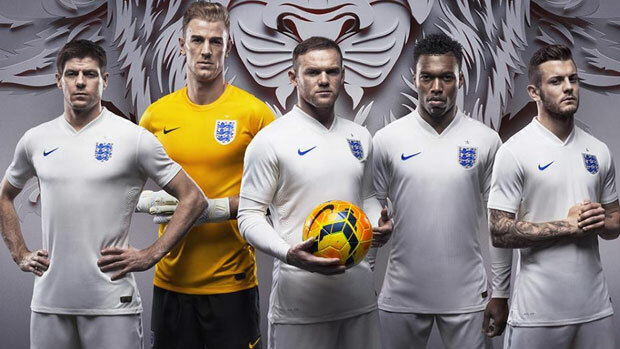 In the three World Cup fixtures, England had the 2014 FIFA WORLD CUP BRAZIL logo embroidered onto the right sleeve and the FOOTBALL FOR HOPE FIFA logo on the left sleeve. Against Uruguay and Costa Rica, the swords on each side of the opponent's name were coloured in reverse to every other game, so that they were in solid blue in the top half on the left and in the bottom half on the right, and outlined in blue in the bottom half on the left and in the top half on the right. Alex Oxlade-Chamberlain only included his paternal family name (CHAMBERLAIN) on his shirts. For the seven European Championship qualification fixtures, England had the competition logo embroidered onto the right sleeve, and the qualifiers logo and the UEFA RESPECT logo on the left sleeve. Against France, England wore the 'breast cancer care' logo on the right sleeve. 38 players wore this shirt. Just as for the previous white shirt, Cahill spent the longest time on the pitch. Wayne Rooney became the ninth player to appear in a hundred England internationals, reaching the historic milestone against Slovenia and marking the occasion by slotting home England's equaliser from the penalty spot. Roy Hodgson gave 8 players their first cap in this shirt. For two of them (Danny Ings and Ryan Mason) it was their only cap. Mason appeared for just short of twenty minutes (including added time) in Italy. Harry Kane had won 30 caps by the end of the 2018 World Cup. 10 players won their last cap in the shirt, most notably in the World Cup against Costa Rica, when Frank Lampard captained the side for his 106th appearance, equalling the total of Sir Bobby Charlton, but finishing one short of Ashley Cole's 107. Steven Gerrard came on as a substitute in the 73rd minute against Costa Rica. It was his 114th appearance, one short of the most capped outfield player at that time, David Beckham. After holding the all-time England goalscoring record for 45 years, Sir Bobby Charlton's total was finally overhauled when Wayne Rooney became the first to score fifty England goals, with an expertly-dispatched penalty against Switzerland at an appreciative Wembley Stadium. 3 players scored their first international goal in this shirt, with Harry Kane moving on to 19 by the end of the 2018 World Cup. 3 players scored their last international goal in the shirt. It was the third for both Phil Jagielka and Andros Townsend. One of the two own goals was scored by Alessandro Della Valle and it was the second time that the San Marino defender had got his name on the England scoresheet. Eighteen months earlier, in Serravalle, he had also netted for England. Gerrard and Lampard both retired from international football after the 2014 World Cup and Rooney was immediately installed as captain. Cahill, Jagielka and goalkeeper, Joe Hart all captained England for the first time when Rooney was unavailable, with Cahill making further appearances in the armband. Nike were very proud of their second set of England kits, with creative director, Martin Lotti stating that, "we wanted to pay homage to key moments in England's proud footballing history". He went on to add that, "two references really stood out during the design process for the home kit - that stunning all-white kit England wore in Mexico in 1970 and the idea of the armour of English knights. You can see subtle references to the armour in the pinstripe, which carries a hint of shine, and in the white satin tape on the shoulders. We wanted to add some small detail that echoed the glow of the armour worn by St. George". There was also a metallic weave in the crest to create another shimmering effect. Having replaced Umbro's scrolls containing each opponent's name, with the 150th anniversary logo, for their first set of England shirts, Nike now re-introduced their own version of match details, to appear underneath the emblem, and they included a pair of heraldic sword points for good measure. The shorts reverted back to white, as they had done for each of the two previous tournaments, with Nike interpreting FIFA's ruling of 'one predominantly dark and one predominantly light" as meaning that they should all be single-colour kits. A satin seam-stripe continued the shiny theme and the central back section of the shorts featured Nike's 'signature laser vents' to aid in cooling and allow for moisture management. Very polite. Even the socks were innovative, with strategically cushioned zones providing comfort and protection at the big toe and ankle bones where the majority of impacts occur, while arch support locked down the foot to help prevent slipping. So, we can't blame the kit, then. England certainly looked the part in Brazil, but the more experienced heads of Italy and Uruguay ensured that the key moments all turned against them and they were on the plane home before they'd had a chance to demonstrate the exciting potential that we all thought they had. An extremely comfortable European Championship qualifying campaign followed, with England winning every match, though a defeat in Spain to the defending champions reminded us of the standard that needed to be reached when it came to the crunch. The last appearance of the kit was for a Wembley friendly against France, where England wore a charity patch on their sleeves for the first time. Breast Cancer Care was the worthwhile cause, but the occasion was, understandably, taken over by an outpouring of solidarity for the French people, following the atrocities committed in Paris, four nights earlier. An alternative pair of blue shorts (with the silver satin strip down the seams, and white numbers and white Swoosh) was worn by the Under-21s with this kit in Norway on 7 September 2015. England: Jack Butland, Michael Keane, L.Garbutt, Nathaniel Chalobah, L.Moore, B.Gibson (Harry Kane), T.Ince (W.Hughes), James Ward-Prowse, S.Berahino, T.Carroll, Nathan Redmond (A.Pritchard). England: J.Bond, Michael Keane, L.Garbutt (T.Blackett), W.Hughes, L.Moore, J.Lascelles, S.Berahino (A.Pritchard), J.Forster-Caskey, Harry Kane, T.Carroll, Nathan Redmond (Danny Ings). England: Jack Butland, Michael Keane (Eric Dier), Luke Shaw, W.Hughes (T.Ince), B.Gibson, L.Moore, S.Berahino, J.Forster-Caskey, Harry Kane, T.Carroll, Nathan Redmond. England: Jack Butland, Carl Jenkinson, L.Garbutt (J.Robinson), W.Hughes (Nathaniel Chalobah), B.Gibson, Michael Keane, T.Ince, J.Forster-Caskey, Danny Ings (P.Bamford), T.Carroll, Nathan Redmond (A.Pritchard). England: J.Bond, Michael Keane, L.Garbutt, Nathaniel Chalobah (J.Forster-Caskey), B.Gibson (Carl Jenkinson), J.Lascelles, T.Ince, A.Pritchard (Danny Ings), Harry Kane (Callum Wilson), T.Carroll, Nathan Redmond. England: M.Battinelli, Calum Chambers (Carl Jenkinson), M.Targett (L.Garbutt), J.Forster-Caskey, Michael Keane, L.Moore (John Stones), A.Pritchard (Jesse Lingard), James Ward-Prowse, C.Woodrow (Danny Ings), T.Carroll (W.Hughes), Nathan Redmond. England: J.Bond, Carl Jenkinson, L.Garbutt, J.Forster-Caskey (Calum Chambers), John Stones, B.Gibson (Michael Keane), Jesse Lingard, James Ward-Prowse, Danny Ings, W.Hughes (A.Pritchard), Nathan Redmond. England: Jack Butland, Carl Jenkinson, L.Garbutt, W.Hughes (Ruben Loftus-Cheek), John Stones (Calum Chambers), B.Gibson, A.Pritchard, James Ward-Prowse, S.Berahino (Harry Kane), T.Carroll, Nathan Redmond (Danny Ings). England: Jack Butland, Carl Jenkinson, L.Garbutt, Jesse Lingard (Danny Ings), L.Moore, B.Gibson, Nathaniel Chalobah, James Ward-Prowse (W.Hughes), Harry Kane, T.Carroll (A.Pritchard), Nathan Redmond. England: Jack Butland, Carl Jenkinson, L.Garbutt, L.Moore, Nathaniel Chalobah, B.Gibson, A.Pritchard (Jesse Lingard), W.Hughes (Danny Ings), Harry Kane, T.Carroll (Ruben Loftus-Cheek), Nathan Redmond. England: Jack Butland, Carl Jenkinson, L.Garbutt, J.Forster-Caskey (Ruben Loftus-Cheek), John Stones, B.Gibson, Nathaniel Chalobah, Jesse Lingard, Harry Kane, Danny Ings, Nathan Redmond. England: Jordan Pickford (A.Gunn), Joe Gomez (J.Stephens), M.Targett, (D.Iorfa) Ruben Loftus-Cheek, Calum Chambers, Eric Dier (K.Hause), J.Ibe (D.Watmore), James Ward-Prowse (Nathaniel Chalobah), C.Woodrow (J.Wilson), Dele Alli (J.Forster-Caskey), Nathan Redmond (S.March). England: Jordan Pickford, Joe Gomez, M.Targett, Ruben Loftus-Cheek (J.Forster-Caskey), Calum Chambers, Eric Dier, J.Ibe, James Ward-Prowse, C.Woodrow, Dele Alli (Nathaniel Chalobah), Nathan Redmond. 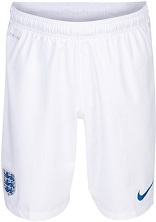 England wore the white home shirt and socks with the alternative blue shorts, against Norway. England: Jordan Pickford, Joe Gomez (D.Iorfa), M.Targett, L.Baker, Calum Chambers, Eric Dier, J.Ibe (D.Watmore), James Ward-Prowse, C.Akpom, Ruben Loftus-Cheek (Nathaniel Chalobah), Nathan Redmond. England: Jordan Pickford, D.Iorfa, M.Targett, L.Baker, Calum Chambers, Nathaniel Chalobah, J.Stephens, James Ward-Prowse, Dominic Solanke (C.Woodrow), Ruben Loftus-Cheek (J.Forster-Caskey), C.Akpom (D.Watmore). England: Jordan Pickford, D.Iorfa, M.Targett, L.Baker, Calum Chambers, Nathaniel Chalobah, J.Swift, James Ward-Prowse, Dominic Solanke (J.Forster-Caskey), Ruben Loftus-Cheek (D.Watmore), S.March (C.Akpom). The Under-21s' shirt did not display match details beneath the emblem, but in the three UEFA Under-21 Championship fixtures in the Czech Republic they wore the tournament logo on the right sleeve and the UEFA RESPECT logo on the left sleeve. Two official players' shirts - the first, issued to Jordan Henderson for the game against Uruguay. The second is believed to have been worn in the first half against Switzerland in Basel, by Danny Welbeck.